I have decided that “providence” is my favorite word. It is providence unlikely and sometimes wonderful things can happen in life.That’s how I met Jeety, my friend from India. A few summers back this beautiful soul walked into my garage during my annual neighborhood yard sale and like two kindred spirits, we immediately connected. Little did I know at the time, Jeety would introduce me to her version of authentic Indian food and it was love at first bite. When I decided to write my cookbook featuring people and food from around the world, I prayerfully considered who I would include in this project. My vision for the book was to introduce my readers to beautiful people from around the world including their stories, their traditions and authentic foods from their country. Besides mouthwatering recipes, the most important piece of this project was to find individuals with a genuine heart for others different from themselves. Jeety was one of these people who I am honored to introduce to the world in my upcoming global cookbook. Last year, Jeety invited my husband and I to join her and her husband for dinner at their home. 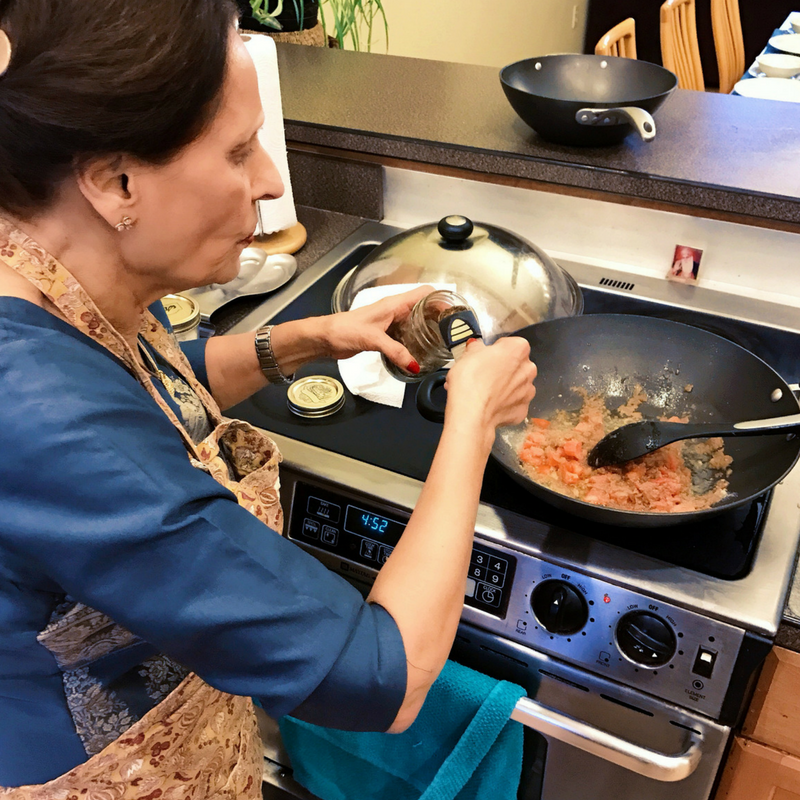 She wanted to teach me how to make authentic Indian cuisine and I was up for the challenge. Now, I thought I was quick in the kitchen, but this talented lady put me to shame in minutes. From Pakoras and Dhiana Chutney to Punjab Chole with Paratha Roti bread, Jeety whipped up dish after dish faster than I could take notes on my computer – and I am pretty darn fast at typing. Finally, I gave up trying to record her steps and decided to become a student by watching. The fun didn’t stop there. Rice Puluo and an Indian Yogurt dish were part of this fantastic feast. The final touch to this authentic Indian meal was Gajar Halwa, a sweet, creamy carrot treat, and of course, the perfect cup of black tea. To say the food was unforgettable doesn’t quite express flavor explosion experienced in every dish served during this lovely evening with friends. As the meal came to an end we had the chance to learn a little about Jeety’s culture, her traditions, and hear a few heartwarming stories of her family and life in India that draws a picture of why she has such a sweet soul. I left Jeety’s home that evening with a greater admiration for the beauty of the Indian culture and its delightful cuisine. 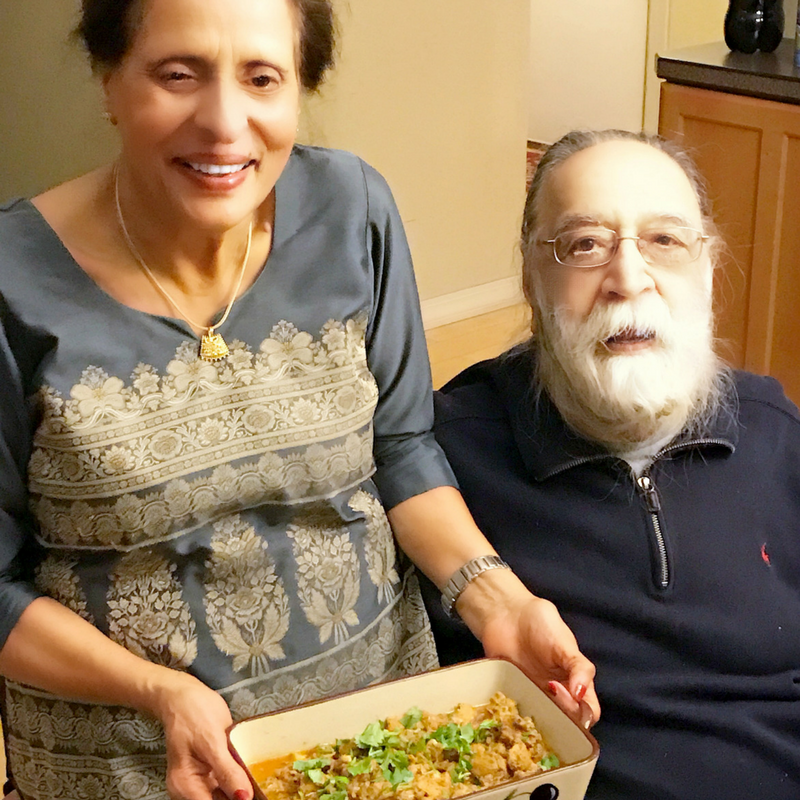 I look forward to introducing you to Jeety and all of her Indian recipes in my upcoming book. Heat oil in medium-sized pan over medium heat. Add onions and sauté 3-4 minutes or until translucent. Reduce heat to medium-low. Add garlic and ginger, continuing to sauté 3 minutes. 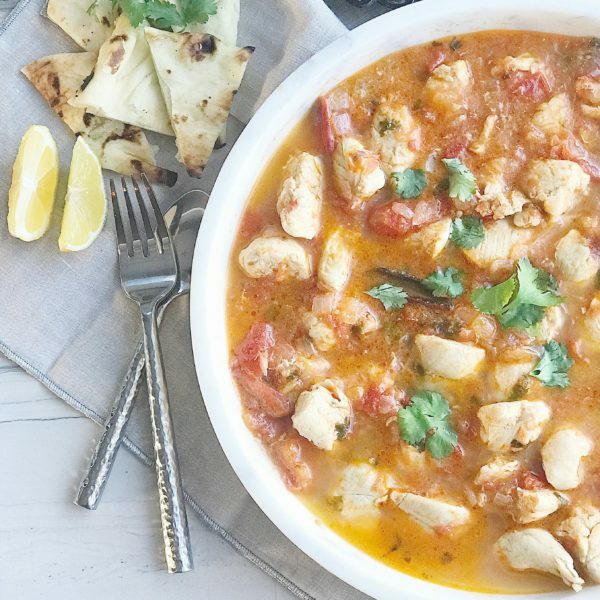 Stir in chopped tomatoes, cumin, salt, coriander, red pepper, turmeric, cloves, cinnamon stick, and 1/2 cup water. Cover and simmer for 3 minutes. Add chicken and stir until meat is lightly coated with spices. Cover and simmer 4-5 minutes or until chicken is lightly browned. Reduce heat to low and simmer 5 minutes. Stir in 4 teaspoons yogurt. Add 1 cup of water and cardamon pods, stirring to combine. Cover, reduce heat to medium-low, simmering for 10 minutes. Fold cilantro into sauce, cover, and reduce heat to low. Continue to simmer 30 minutes. Add 1/2 cup water and simmer 10 minutes or until chicken is cooked through. You can substitute 3 cups chopped chicken tenders in place of the recommended chicken pieces. Time saver: Prepare sautéed onions ahead of time and refrigerate until ready to use.